The key to successful networking. We are very actively and firmly embedded in our professional environment. This keeps us ahead — in ideas, concepts, knowledge, and technology. At the same time, we use every opportunity to share what we know with others. Coaching and consultations for freelance linguists and translation companies since 2000. Help with business decisions and extensive marketing support. Coaching for translators as entrepreneurs since 2002. Accredited by programs supported by the German states and the EU. Support for existing and aspiring entrepreneurs on their path to independence. Assistance with economic, financial, organizational and personal issues; development of solutions and strategies. Presentations, seminars, and workshops for all major German professional associations of linguists as well as organizations outside Germany, including the ATA (USA) and SFÖ (Sweden) since 2000, on the following topics: customer acquisition, complaint management, business start-ups, fee calculation and fee negotiation, customer orientation, and customer communications, online and offline marketing, exhibitions, self-management, time management, linguists as entrepreneurs. 0800 TRIACOM, a free and independent phone-in marketing hotline. 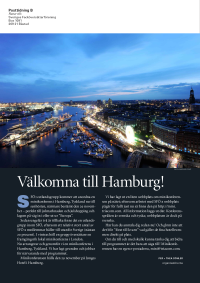 Of our many activities over the years, one was a particular pleasure — the mini-conference we organized in Hamburg, Germany for the Swedish Association of Professional Translators (SFÖ).